S-video is a type of video signal that carries luminance (Y, brightness) and chrominance (C, colour) values as physically separate signals. Also known as Y/C video. 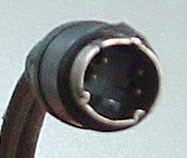 The standard s-video connector is a small four-pin mini-DIN connector. S-video first became popular when it was introduced with S-VHS and Hi8 in the late 1980s. Before this, standard VHS and 8mm formats used composite video signals, normally with RCA/phono connectors. S-video was hailed as a significant improvement because it carries luminance and chrominance separately, so the image is not subject to colour bleeding as it is in composite video. S-video is still in common use today, although being analog it is slowly giving way to digital connections.